VTM-M2: Created by Michael Angel and Michael Heiler. Stunning graphics by GravityLinks. Instructions For Your Free Download: Click the "Try It Free" button. You will be taken to a checkout page. Click the "Proceed To Your Free Download" button. Enter your name and email and receive your download instantly! To install on Mac, simply drag into the VST folder provided. If your DAW is using a different VST folder, then copy over manually. You will be able to use the VTM-M2 for free for several days, with full functionability and including all of the presets. for your Returning Customer Discount. The VTM-M2 is the result of 5+ years of research and design. It stands for "Vintage Tape Machine" and we believe that it defines a new level of authenticity in plug-in technology. It is based upon an original concept developed by Michael Angel of CDSoundMaster called "Virtual Interactive Signal Chain Technology", and has been brilliantly executed in code by Michael Heiler. This unique cooperation has led to this special line of products developed for CDSoundMaster by "MX2" or 'Michael Times Two'. The VTM-M2 reproduces the unique character of reel to reel tape machines for use on all aspects of recording, mixing, and mastering. It can be used on every track of a multi-track project, on a single instance of a final mix or master, on group buss duties, and any combination of the above. It has two completely independent operating modes, calibrated for Low and High calibrated tape settings. This provides a full range of use from subtle, clean response to higher gain, deeper harmonic distortion and compression, giving the user every desired response of a real tape machine without alteration to the source's frequency range. It contains advanced multiple operations yet requires very few parameters for operation. It uses minimal system resources and is ideal for multiple instances and use on every track in dense multi-track session projects. For those who have been using CDSoundMaster Program Libraries for the Nebula Pro Plug-In for several years, the VTM-M2 represents the long-awaited "3rd Stage" for the complete building-block concept for creating absolute authenticity in reel to reel tape inside the DAW. R2R - Reel, Too REAL, and Tape Booster +, are stages one and two, found in the Nebula Pro Plug-In list of CDS original software on this website. R2R brings the user a complete collection of actual reel to reel tape machines, each with its unique frequency response, dynamic response, and harmonic distortion. Not only are multiple machines included in R2R, but each with its own tape speeds and tape stock choices. Literally every authentic nuance of these machines are represented in R2R. So, why three stages? Because Nebula Pro is the finest platform for reproducing absolute accuracy from such machines, and what it does is unrivaled. But, there are certain limitations to what the engine is created to do. Each instance of Nebula Pro acts as a certain process. In this case, tape is reproduced with frequency, dynamic change, and harmonic content. Nebula Pro can also act as a very realistic compressor, but this takes a different form than natural tape compression, and would require a separate instance even if it did include this type of function. This is where Tape Booster + comes in. Tape Booster + is used as a second stage after R2R to build the level of perceived volume based completely on saturation or harmonic content. Dynamic harmonic distortion in exact detail to tape response is what Tape Booster + adds to each individual R2R machine. The two together make for an amazing daily mix, tracking, bus, and mastering tool using any desired machine. And now, stage 3, the VTM-M2. Natural, authentic, complex saturating tape compression with two independent calibrations for subtle mastering work and for higher gain functions. The VTM-M2 is a completely new concept in creating code that sounds like, thinks like, acts like real analog. At literally every dynamic level it is processing uniquely, based upon the input. If it is receiving fast transients, it acts one way, if it is receiving long lyrical passages, it responds differently. If it gets a loud signal it operates uniquely to that signal. If it is given a quiet signal, it operates in a different manner. The VTM-M2 is always compressing, and it is always adding saturation. As it is driven harder, all forms of processing increase, change, and adapt. We believe it is the first product of its kind, and if used on its own, it may very well become your favorite replacement for digital brickwall limiters, mastering compressors, and tape saturation emulators. 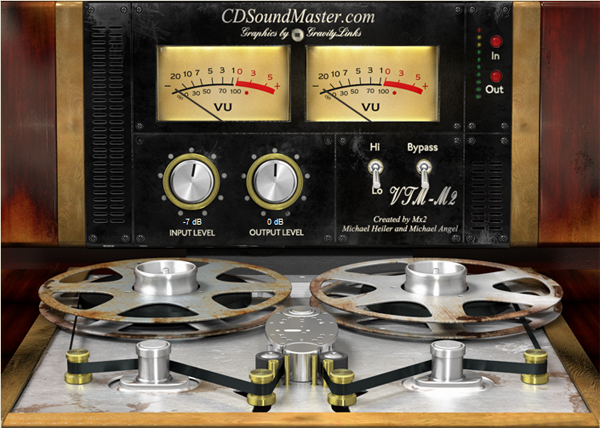 But, when used with R2R and Tape Booster +, you will experience the complete tape revolution that can only come from CDSoundMaster. Choose your unique R2R machine, load some saturation boost from TB+, and then add one instance of VTM-M2 or several! It has been carefully tested and designed never to loose its authentic analog response. We have run the VTM-M2 through its course to make certain that its sound never goes digital!